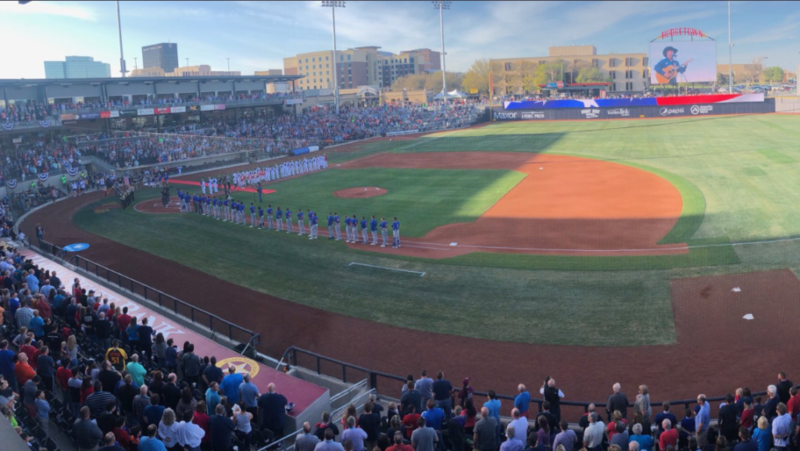 For the first time since 1982, there was professional baseball played in downtown Amarillo on Monday night, and if you ask the city, it’s been a long time coming. Those previous attempts included having teams from leagues such as the United Baseball League and three separate teams in the American Association from 2011 to 2016 (Sox, Thunderheads, and Air Hogs), none of which lasted more than five years. 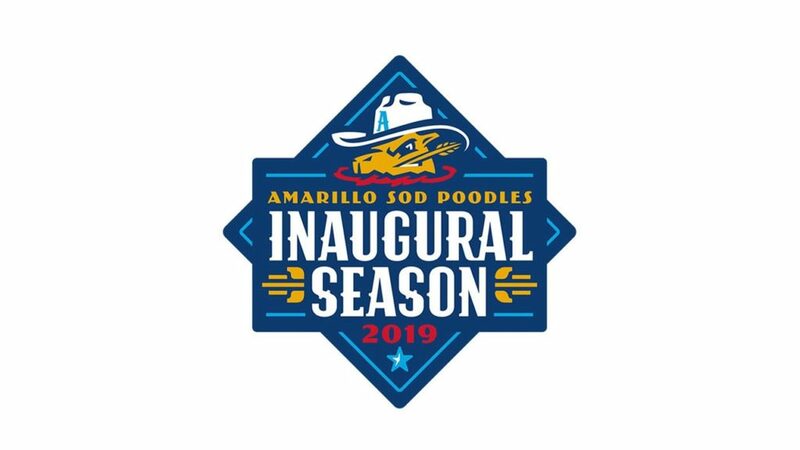 The Sod Poodles started on the right foot selling out the brand new stadium called “Hodgetown” in downtown Amarillo, even though opening night had to compete with the neighbor Texas Tech Red Raiders Men’s Basketball team competing for the national championship that night. For people in Amarillo that love baseball, and particularly Major/Minor League Baseball, up until the Sod Poodles came to town this year the closest place to see professional baseball was actually in Midland, Texas, about five hours away. “I’m really pumped about the team being here; it is so nice not having to drive all the way to Arlington or Midland to watch a baseball game,” new father and Sod Poodles fan Devon Bottoms said. “I’ve even gone to Lubbock at points to watch baseball. I can’t wait to take my little one to the ballpark while he grows up. I expect this team to be a consistent trip in our house.” The Rockhounds just so happened to be in the opposing dugout on Monday night. RHP Reggie Lawson delivered the first pitch in decades for a strike after the Sod Poodles received the red carpet treatment for player introductions. Lawson threw only 37 pitches in the first three innings before running into trouble in the 4th, in which he threw 32 pitches, and the Rockhounds plated three runs, including a home run by catcher Jonah Heim. Lawson went back out for the fifth and finish it, giving up one more run but collecting a pair of strikeouts making it eight on the night, one short of a career high. Lawson was relieved in the sixth by Tyler Higgins, who was dominant in two innings facing the minimum and striking out four. In a week full of firsts, shortstop Owen Miller once again collected the first hit in franchise history (first hit at home and on the road), this time at home in Amarillo ,wasting no time by collecting it in the first inning with a single to center field. The first run in the new stadium came off of the bat of center fielder Buddy Reed when he hit a home run that hugged the right-field line, giving the Sod Poodles a 1-0 lead in the 3rd inning. After Midland did their damage in the fourth and added one more in the fifth against Lawson to make it 4-1, Brad Zunica got ahead 3-1 in the count and hit his third home run of the season, continuing his tear to begin the year, and Buddy Reed drove in another run with a sacrifice fly to score Olivares, making it 4-3 Rockhounds. The Sod Poodles then for the third inning in a row homered in the sixth, this time off of the bat of left fielder Jorge Ona tying the game at 4-4 where it would stay until extra innings thanks to pitching performances from Higgins and Trevor Megill. Megill and Higgins combined for four Innings pitched, one hit, one walk, and six strikeouts forcing the game into extra innings. In the bottom of the ninth after a Zunica walk and a sacrifice from Olivares, the Sod Poodles sent Chris Baker to run for Zunica at second. Second basemen Peter Van Gansen hit a line drive that dropped to Midland right fielder Greg Deichmann who immediately threw home as Baker had rounded third. In a weird sequence of events, Jonah Heim missed the tag on Baker but the pinch runner missed the plate, Heim put the tag on Baker after realizing the umpire hadn’t made a call, denying the Sod Poodles a win and sending the game into extra innings. In extra innings David Bednar replaced Trevor Megill. Minor League rules have a runner starting on second to start extra innings. 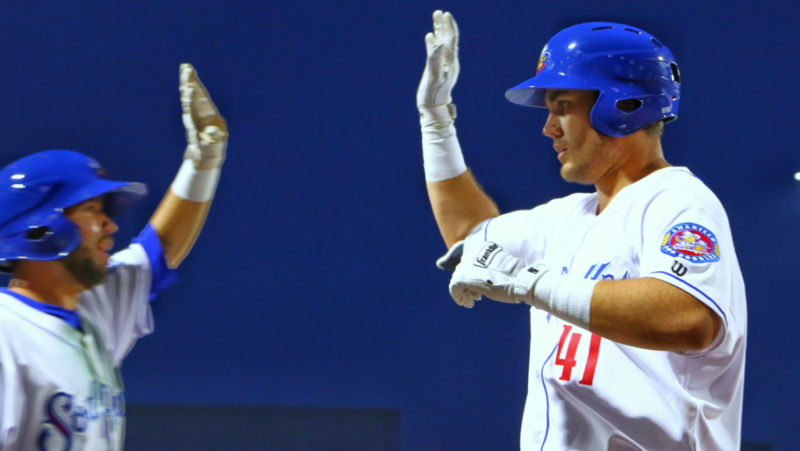 The Rockhounds bunted the runner to 3rd base and collected three consecutive hits and scoring two runs, making it 6-4, but it didn’t end there as Midland scored another one with a ground out and two more with a home run from Deichmann, who had just saved the game in the ninth, making it 9-4. The Sod Poodles went down in order in the bottom half of the 10th, dropping the home opener. Despite the loss, Amarillo received a standing ovation from their new home. Austin is a self proclaimed "sports nut" who lives and breathes baseball. The Amarillo native spends his time writing and running the Painting Corners Podcast. He will be covering the Amarillo Sod Poodles for EVT this year.